Appellation or Vine Carignano del Sulcis D.O.C. This wine is obtained from Carignano grapes, with the modest presence of Bovaleddu, which comes from very antique vineyards where the grapevines aren't grafted. But rather they are cultivated on saplings (Latin vineyards) in the best clayey and sandy areas of the lower region of Sulcis. The production is extremely modest per stem, (it does not exceed a kilo and a half) and it gives origin to musts of great richness. The grapes picked between the end of September and the beginning of October are harvested in stainless steel containers where the fermentation and maceration take place at a temperature of 25-28°C with pumping must over grape dregs and frequent airing. The maceration period is concluded within 15-16 days. The malolactic fermentation is precocious so much so that the wine is then put in new French oak barriques and the end of December for the evolution and the aging, which takes about 16 to 18 months maximum. It's complement is polymerised very well in this arc of time since the tannins of the peels are perfectly mature when the harvesting begins, thanks to the sun and the luminosity which is always present. 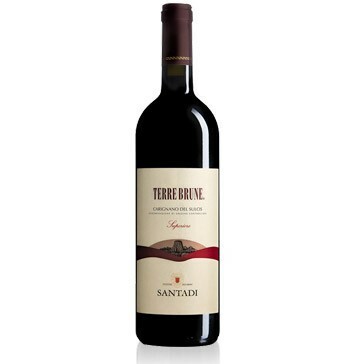 The Terre Brune is not filtered; after it is decanted it passes very delicately in the bottle where it stays for about a year at a temperature of 14°C. It's colour is ruby red but tends to be more that of a pomegranate. 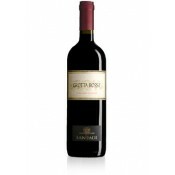 The rich and intense bouquet, which bring marasca cherries as well as dried fruit to mind. The texture is full and intense and it has a great structure. Goes well with meat dishes, wild game and seasoned cheeses. It is advisable to open the bottle two or three hours beforehand. It should be served at a temperature of 18-20 degrees centigrade. The perfect glass is a smooth and transparent crystal glass. This is a wine, which is greatly enhanced with age, and it has a better flavour after many decades. The bottles must be placed horizontally in a cool, damp and dark cellar. An article titled "Il mercato del vino scopre il web" (The wine market discovers the web), quotes Wineshop.it among the best online wine shops.